Apple's Phil Schiller took the stage today at Apple's media event in Cupertino to officially unveil the iPhone 4S, Apple's latest entry in the iPhone family. As widely expected, the iPhone 4S looks exactly like the existing iPhone 4 model -- industrial design with metal band in the middle, glass front and rear panels. 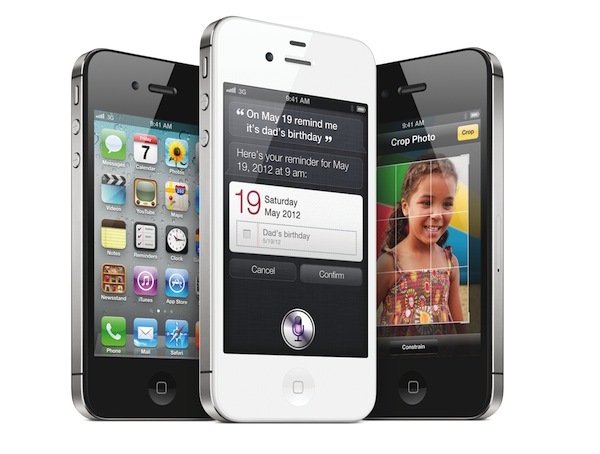 The iPhone 4S is powered by Apple's dual-core A5 chip, which will allow for graphics up to 7 times faster. To demonstrate the 4S' graphic capabilities, Apple invited Epic Games on stage to demo Infinity Blade 2, which will be available on December 1. In spite of the iPhone 4S' faster processor and dual-core graphics, Apple is guaranteeing 8 hours of 3G talk time, 6 hours of 3G browsing, and up to 10 hours of video/40 hours of music. The iPhone 4S comes with a new wireless system as well -- downloads are faster over 3G with up to 14.4Mbps down. The iPhone 4S is a world-phone as previously rumored, integrating both GSM and CDMA technologies in a single, updated antenna design. 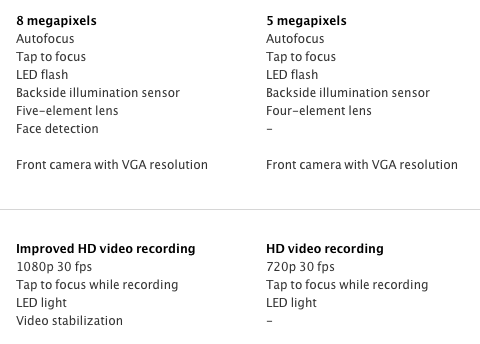 The camera has been improved: the 4S has an 8 megapixel sensor shooting pics at 3264 x 2448 resolution. That's 60% more pixels that the old iPhone's camera. The iPhone 4S' camera has backside illumination, the new sensor will allow the camera to gather 73% more light, and it's faster than the iPhone 4's old camera. The new Image Signal Processor Apple designed will also enable face detection and 26% better white balance. Apple has compared the iPhone 4S' camera loading times to other phones, and it turned out the iPhone 4S shoots the first photo in a second, with the second picture to follow in 0.5 seconds. Apple has touted the iPhone 4S' camera as one advanced piece of technology producing beautiful shots, which can also be used for macro photography if the user wants. The iPhone 4S does 1080p video recording with image stabilization and temporal noise reduction. Because the 4S is more powerful than the old iPhone 4, Apple has now enabled AirPlay Mirroring to mirror the display to an Apple TV (just like the iPad 2 already does), as well as video out. 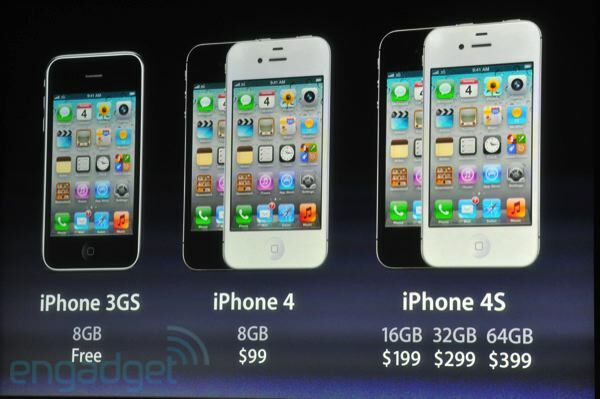 There's also a new 8 GB iPhone 4 priced at $99, whilst the 8 GB iPhone 3GS will be kept free on contract. Pre-orders for the iPhone 4S will start this Friday, October 7th. The device will go on sale in US, Canada, Australia, the UK, France, Germany, and Japan on October 14th. 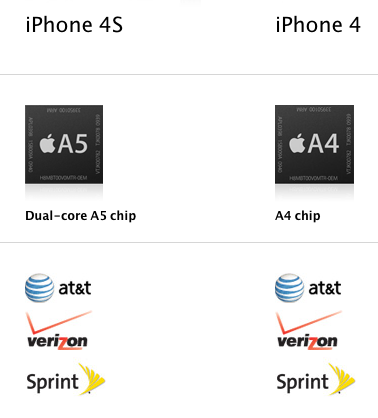 In the US, Sprint is a new carrier for the iPhone 4S. On October 28th, the iPhone 4S will go on sale in 22 more countries with 70 countries by the end of the year. And here's the iPhone 4S (above) compared to the iPhone 4 (below). The iPhone 4S weighs 3 grams more than the iPhone 4 (please note that Apple is using the new 8 GB iPhone 4 model in these comparison charts). More comparison shots: the 8 GB iPhone 4 is coming to Sprint too, and it's clear the 4S' camera is much improved. The iPhone 4S has less hours of stand-by time, but one hour more of talk time on 3G. Last, the new prices. Free iPhone 3GS (on contract) on the right. Update: Apple has posted the official YouTube videos for the iPhone 4S and iCloud. Apple today announced iPhone® 4S, the most amazing iPhone yet, packed with incredible new features including Apple’s dual-core A5 chip for blazing fast performance and stunning graphics; an all new camera with advanced optics; full 1080p HD resolution video recording; and Siri™, an intelligent assistant that helps you get things done just by asking. With the launch of iPhone 4S also comes the launch of iOS 5, the world’s most advanced mobile operating system with over 200 new features; and iCloud®, a breakthrough set of free cloud services that work with your iPhone, iPad®, iPod touch®, Mac® or PC to automatically and wirelessly store your content in iCloud and push it to all your devices. Improving on the innovative stainless steel external, dual-antenna design of iPhone 4, iPhone 4S is the first phone to intelligently switch between two antennas to send and receive. iPhone 4S now supports twice the download speed with HSDPA of up to 14.4 Mbps and iPhone 4S is a world phone, so both CDMA and GSM customers can now roam internationally on GSM networks.